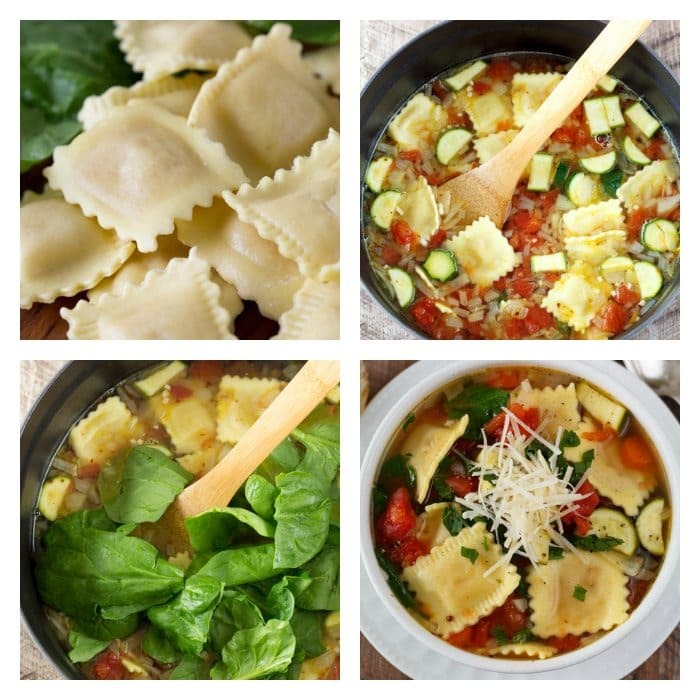 Ravioli Soup- A quick, one pot dinner idea the whole family will love. 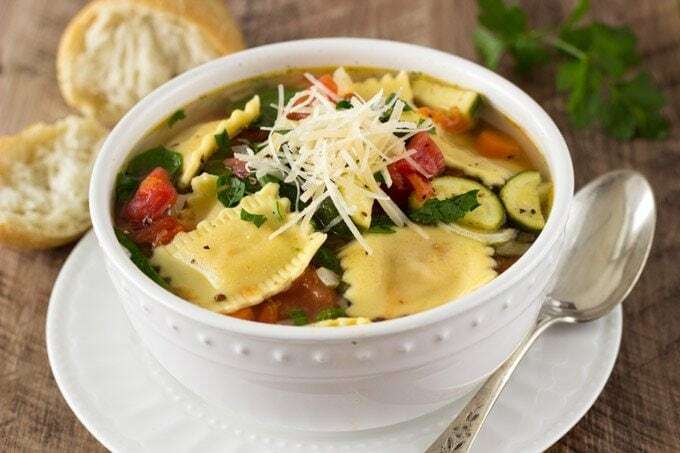 Healthy fresh vegetable soup gets kicked up a notch with the addition of fresh ravioli. A hearty filling meal that won’t break the bank. This is a highly adaptable recipe that allows you to incorporate your favorite fresh veggies and favorite fresh ravioli pasta. The prep time on this meal is next to nothing…you’ll just need to give the veggies a quick chop and cook the heartier varieties (like onion, carrots etc.) for a couple of minutes. Add the broth (chicken or vegetable) and bring to a boil. Add the ravioli and cook for the appropriate time according to the package directions. 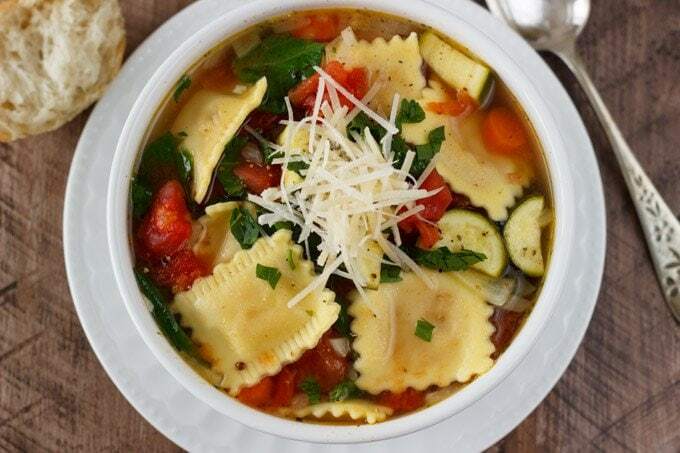 Maybe throw in a handful or two of spinach and there you go…Ravioli Soup is ready. I don’t know if you’ve shopped in the fresh made ravioli section of the store lately, but it’s possible to find so many varieties of ravioli (butternut squash, mushroom, sausage, crab, cheese, spinach, just to name a few) and they are all reasonably priced. I was able to purchase a butternut squash variety for under $4 (on sale) add the cost of broth and veggies and a loaf of bread – the whole meal (4 servings) was under $12. That’s about $3 a serving…for a nutritious, hearty meal! That’s CRAZY good! In a large pot, heat olive oil over medium heat. Add onions, carrots and zucchini and cook until onions become slightly translucent (approx. 5 min.). Add vegetable broth, diced tomatoes, basil, red pepper flakes , and oregano. Bring to a boil. Add ravioli and cook according to package directions (different types of ravioli will have a different cook times). Salt and pepper to taste.